Table Tennis Players Battle For Every Point. Chalfont St Peter CE Academy fought their way through a gruelling table tennis championships in the English Schools National Finals at Hinckley, Leicestershire on Saturday. 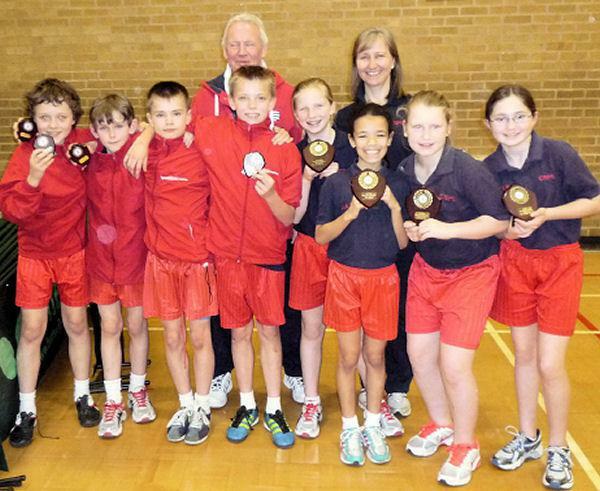 Very strong opposition forced the boys and girls squads, who had qualified last month at Cheltenham, to perform at the highest level to win points. By the end of an enthralling day’s play Chalfont St Peter CE Academy played some brilliant table tennis to achieve silver medals in the U11 Girls’ competition and 4th position for our boys. Special thanks go to Mrs Jenny Hill for her coaching of the two teams and managing the South Bucks table tennis league so efficiently. Thanks also go to the parents and friends of CSPA who supported so enthusiastically throughout the day.